At DEI Equipment, we take great pride in offering a wide variety of catering equipment for meeting all your serving needs. With our smartly designed fast food trays, we make it very convenient for you to serve the food in a quick serve environment. These trays are especially designed to cater to the demands of fast food outlets, which regularly experience a heavy traffic. They are made from heavy-duty material and are fully capable of bearing all the stress and pressure related to high volume scenarios. We are making these dishwasher-safe fast food trays available to you at very economical prices. 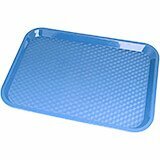 These colorful trays have been approved by National Sanitation Foundation (NSF) and they are 100% safe for use around food and food preparation. Rectangular fast food trays, large. Dimensions: 14" x 18"
Rectangular fast food trays, mid-size. Dimensions: 12" X 16"
Rectangular fast food trays, small. Dimensions: 10" x 14"